Whenever our site drops ranking in search engine, we always think that there has been penalty on our site. However it’s not always true as most of the times it happens because of the regular Google algorithm changes but sometimes it happens when the site has been actually penalized by Google due to the violation of quality guidelines. Penalty can be of two types – manual penalty or algorithmic penalty. 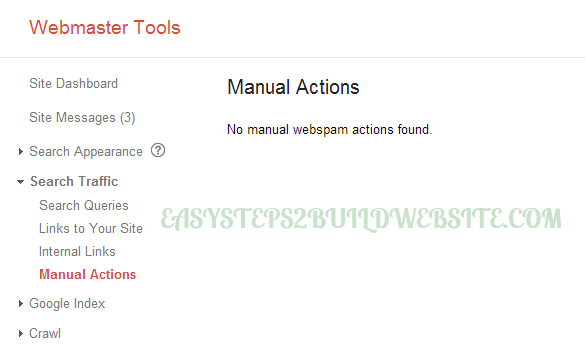 We are taking about manual penalty here, when someone from Google webspam team manually reviews the site and take action against it. Such penalties doesn’t go away with time for that you have to file a reconsideration request after removing the cause of manual action, it’s more or like a confession for what have you done wrong. Earlier we used to get an email, when there has been a manual action taken on the site owned by us. It used to be a confusion whether the site has been actually penalized or not since there were cases when webmaster didn’t receive any emails even though they were having manual actions taken against their site. This feature would be really helpful for the webmaster. Also, Google webspam team can have a deep breath as they had to respond for the reconsideration requests even though the site didn’t have any manual penalty. It would definitely reduce the number of reconsideration requests filed every month and so.